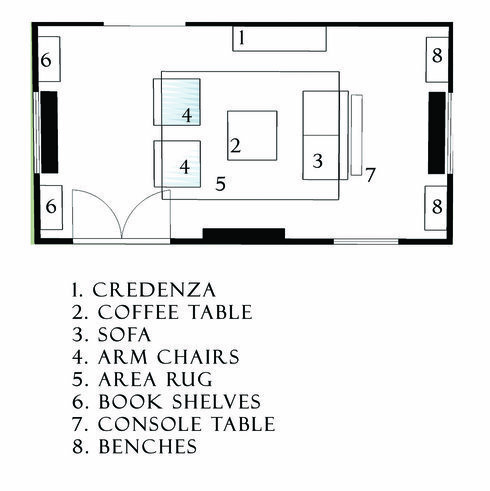 I have no idea of what i want to do and have an oddly shaped living room. We have a 1928 Colonial home with hardwood floors throughout. There are quite a few entry points and then windows that make this room a bit tough for us to design. - We have a couch and chair that we don't want to keep. - Another problem we have is that room the room is dark. The flooring is dark, we don't get a ton of natural light and would love any help with brightening up that space. 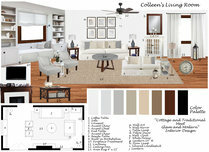 - Have a ceiling fan currently but would like another one that offers better general lighting. We're pretty simple people, not very fussy. Our style is hard to pinpoint, but hopefully the inspiration images give you better understanding with the direction we want to go. 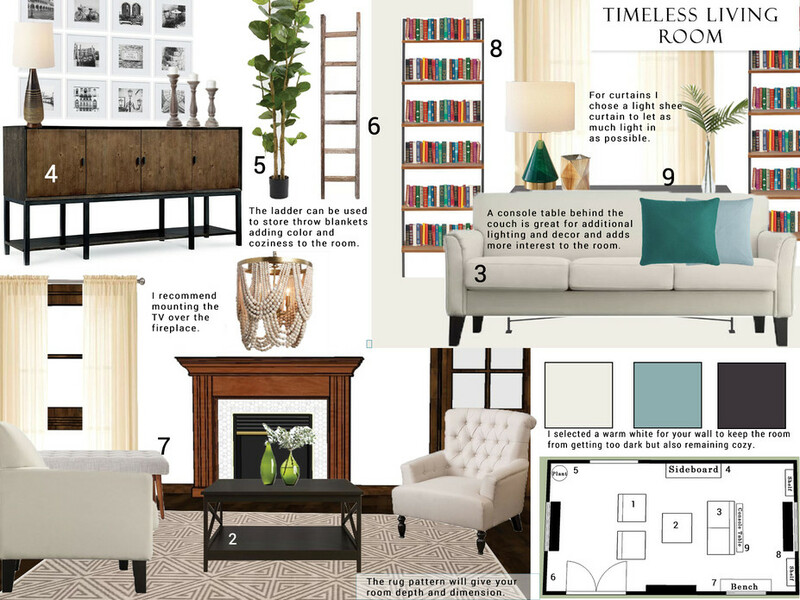 We love the sophstication and simplicity of your design - it is serene and yet comfortable. Brian and I are very excited. We love the furniture, the carpet and the wall grouping. Marcoux 5 Blade Ceiling Fan with Remotes Weathered pine blades and matching accents around a slender housing in a rich aged bronze finish give the Marcoux a rustic elegance like no other fan. Product Details Included Items & Accessories: Wall Control; Remote Control; Downrod Room Size: Large rooms (up to 18 X 20) Mounting: Downrod Light Kit Included: Yes Discount link available to project holder only Overall Product Weight	14.66 lb. Fan Body Width - Side to Side	7.2'' Fan Body Height - Top to Bottom	22.57'' Fan Body Depth - Front to Back	7.2'' Blade Span	56'' Downrod Included	Yes Downrod Size(s)	1 x 8"
Taupe Geometric Lattice Bali Indoor Outdoor Rug Featuring a geometric lattice design on a neutral taupe background, this indoor-outdoor rug refreshes a traditional pattern for contemporary decor. Flat-woven of soft fabric with a low pile, this versatile area rug is easy to clean, pet-friendly and perfect for high-traffic areas, decks or patios. 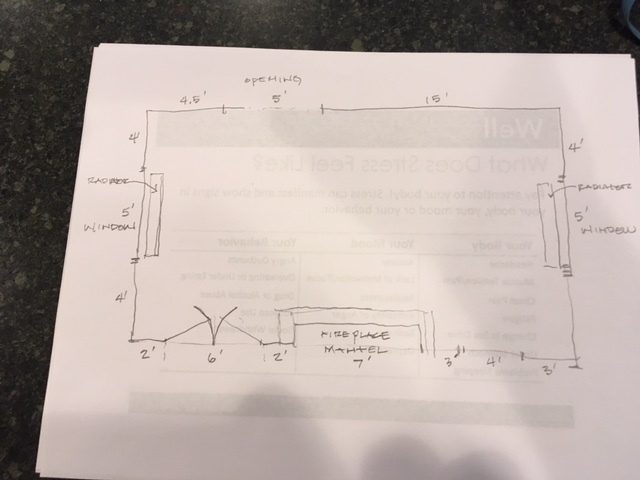 Discount link available to project holder only 6'7"W x 9'6"L, 17 lbs. Faux Sea Grape Plant Lend a beachy feel to any corner of your home with our faux sea grape plant, a native of tropical coastlines known for its rich color and broad, round leaves. With posable branches and a simple weighted stand, it's ready to arrange in the basket or pot of your choice. Discount link available to project holder only Overall: up to 46"Dia. x 63"H, 13 lbs. NODI VASE The Nodi Vase is a glass vase that comes in two sizes and colors. The green vases add color to your space while the clear vases add shape and highlight its contents. Both are the perfect way to display a fresh floral arrangement or artificial floral bunch. Discount link available to project holder only SHORT: 7" X 7" X 11 1/4" TALL: 6" X 6" X 16"
Dusty Blue Herringbone Cotton Throw Pillow Crafted of soft 100% cotton with a herringbone weave and clean mitered seams, our exclusive dusty blue pillow is a classic update for any seating arrangement. Pick up multiple colors to refresh your decor instantly and affordably. Discount link available to project holder only 20"Sq. Teal Green Herringbone Cotton Throw Pillow Crafted of soft 100% cotton with a herringbone weave and clean mitered seams, our exclusive teal green pillow is a classic update for any seating arrangement. Pick up multiple colors to refresh your decor instantly and affordably. Discount link available to project holder only 20" sq. Mid-Century Table Lamp - Taper See in a vintage light. Hand painted in a mod black palette, the subtly textured, wood-based Mid-Century Ceramic Table Lamp's organic silhouette, elegant taper shape and geometric pattern is inspired by 1950s and '60s design. 11.5"diam. x 26"h. Black ceramic body. Wood base in Acorn finish. White linen shade. Imported. Discount link available to project holder only 11.5"diam. x 26"h.
Metalized Glass Table Lamp + USB - Small (Green) Our Metalized Glass Lamps have a luminous hand-blown base with luxe, saturated color. A built-in USB port makes this perfect anywhere—bedside, desk, family room—you want to stay connected (no charging block required!) 13"diam. x 19.75"h. Mouth-blown glass body in a Green finish. Metal base in an Antique Brass finish. Linen shade in White. Cloth-wrapped cord. Built-in USB port at base. Plug-in. Imported. Discount link available to project holder only 13"diam. x 19.75"h.
Quantity: 2 skip to dimensions skip to reviews skip to assembly overviewup against the wall. All the right angles for all the right stuff. Six fixed acacia veneer shelves stained a warm midtone brown ladder a squared metal tube frame powdercoated carbon. Space-saving modular design allows for dramatic repetition down the wall. Stud mounting recommended; hardware included for drywall installation. Levelers included. 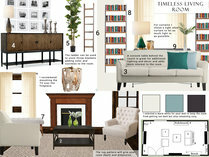 helix 96" acacia bookcase is a CB2 exclusive. Discount link available to project holder only overall dimensions width: 30" depth: 11.75" height: 96"
Prism Mercury Vases + Candleholders Modern geometric shapes meet illuminating elements with our Prism Mercury Vases and Candleholders. With a reflective mercury finish on the inside, each one looks especially striking when lit. They also double as vases when filled with dried botanicals. Glass with reflective mercury-finished interior. Not water-safe; for use with dried botanicals only. Sold individually. Made in India. Discount link available to project holder only Small: 4.5"sq. x 5"h. Medium: 5.5"sq. x 7"h.